Welcome to a fresh alternative to fast food! Since 1996, Camille’s Sidewalk Cafe has offered only the best, most flavorful, chef inspired menu items for our guests. 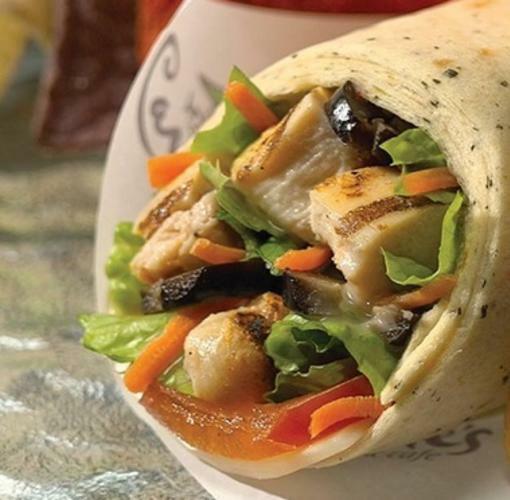 We use only the freshest ingredients and time honored methods to make everything on our menu, from our zesty Tex Mex Club and Quesadilla Wrap to our Veganini Panini and Cafe Chicken Salad Sandwiches. It's hard to make a decision with so many tantalizing options. Add a steaming cup of Camille's signature Tuscan Tomato soup, a fresh blended fruit smoothie, or a warm freshly baked cookie and you have the perfect choice for a satisfying, quick and delicious meal. Camille’s also offers fresh salads, a full line of Artisan Flatbread Pizzas and a wide variety of desserts and baked goods with a full coffee bar.